Just half of adults with chronic conditions use the internet; but once online, they are avid consumers of health information. Adults living with a disability or chronic disease are less likely than others to go online, but once online, are avid health consumers. About a fifth of American adults say that a disability, handicap, or chronic disease keeps them from participating fully in work, school, housework, or other activities. Half (51%) of those living with a disability or chronic disease go online, compared to 74% of those who report no chronic conditions. 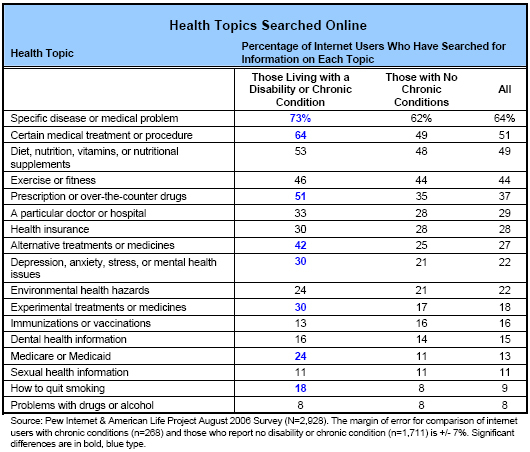 Fully 86% of internet users living with disability or chronic illness have looked online for information about at least one of 17 health topics, compared with 79% of internet users with no chronic conditions. Throughout this report, we refer to internet users who have looked online for health information as “e-patients.” And we refer to those who identify themselves as living with disabilities or chronic disease that prevents them from participating fully in work, school, housework, or other activities as those having “chronic conditions.” This population is characterized by a comparatively greater portion of people age 50 and older and those who do not use a computer on a regular basis. In order to capture a portrait of a typical health search, we asked respondents to think about the most recent time they had gone online for health or medical information. Fifty-three percent of all e-patients say their last search had an impact on their own health care or the way they care for someone else; 42% say it had a minor impact and 11% say the last search had a major impact. 75% of e-patients with chronic conditions say the information they found in their last search affected a decision about how to treat an illness or condition, compared with 55% of e-patients who report no disability or illness. 69% of e-patients with chronic conditions say the information led them to ask a doctor new questions or to get a second opinion from another doctor, compared with 52% of other e-patients. 57% of e-patients with chronic conditions say the information changed the way they cope with a chronic condition or manage pain, compared with 36% of other e-patients. 56% of e-patients with chronic conditions say the information changed the way they think about diet, exercise, or stress management, compared with 42% of other e-patients. 36% of e-patients with chronic conditions say the information affected a decision about whether to see a doctor, compared with 35% of other e-patients. 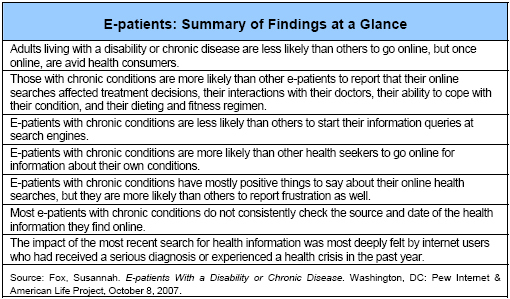 E-patients with chronic conditions are less likely than others to start their information queries at search engines. Fifty-six percent of e-patients with chronic conditions began their last online health inquiry at a search engine; 37% began at a health-related website. This is somewhat different from e-patients who report no disability or illness: 67% of that group starts at a search engine and 27% start at a certain website. E-patients with chronic conditions are more likely than other health seekers to go online for information about their own conditions. Not surprisingly, e-patients with chronic conditions tend to devote more attention to their conditions than those who report no serious illness or disability. Fifty-three percent of e-patients with chronic conditions say their last search was in relation to their own health questions, whereas 33% of e-patients with no chronic conditions say their last search was in relation to their own health or medical situation. E-patients with chronic conditions have mostly positive things to say about their online health searches, but they are more likely than others to report frustration as well. Most e-patients, including those living with chronic conditions, are likely to identify with positive descriptions of their last search for health information online. The following responses were in line with answers from the general population of internet users who go online for health information. 71% of e-patients with chronic conditions say they felt reassured that they could make appropriate health care decisions during their last search for health information online. 59% say they felt relieved or comforted by the information they found online. 55% say they felt eager to share their new health or medical knowledge with others. 30% say they felt overwhelmed by the amount of information they found online. 19% say they felt confused by the information they found online. 31% of e-patients with chronic conditions say they felt frustrated by a lack of information or an inability to find what they were looking for online, compared with 20% of e-patients who report no chronic conditions. The impact of the most recent search for health information was most deeply felt by internet users who had received a serious diagnosis or experienced a health crisis in the past year. One-quarter of adults (27%) say they or someone close to them has been diagnosed in the last 12 months with a chronic medical condition, such as asthma, diabetes, heart disease, or high blood pressure. One-third (34%) of American adults say they or someone close to them faced a serious medical emergency or crisis in the past 12 months. Members of these two groups who have searched online for health information are more likely than other e-patients to say the information they found had a major impact on their own care or the way they care for someone else.